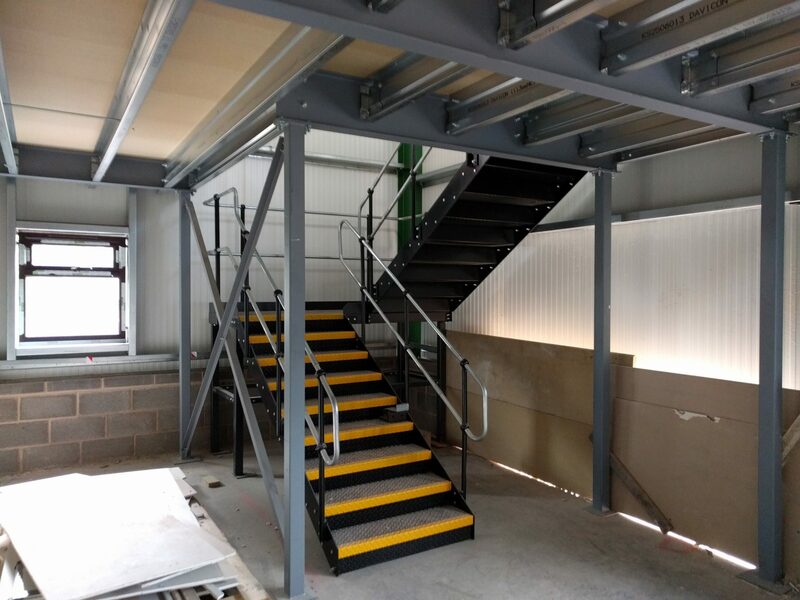 A mezzanine floor is an easy way to create, or increase, office space. Using the vertical space you already have in your premises makes perfect sense, it allows growth of your business without the expense of moving or extending a building. 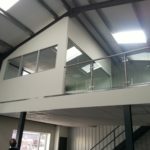 We are able to offer you a full package of works; from our initial site survey, to carrying out the mezzanine flooring installation through to fitting it out to the extent you require (from just creating fire protection to it if required, to fully forming a complete office suite throughout with various partitioning systems). We can also take care of all building regulation compliance as part of the works. We are a ConstructionLine Gold, SafeContractor, and CHAS health and safety accredited company, have all required insurances and trained operatives. 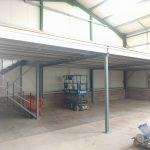 Below are a few pictures some mezzanine floor offices, before any work started and after completion. If we can help you any further please do get in touch with us. 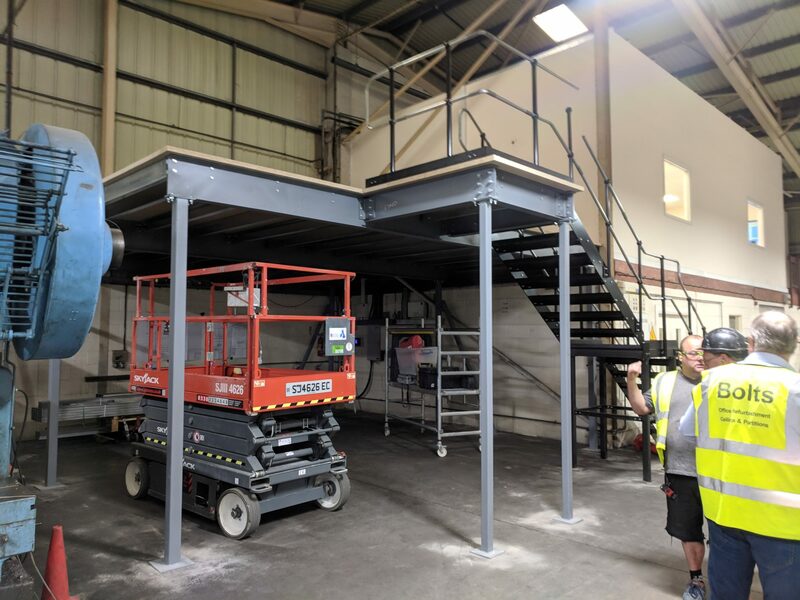 Pharmaceutical company – installation of a new mezzanine floor to create more office space in their warehouse area; this installation created multiple single offices, an open plan office and tea point at first floor, and then a new packaging area at ground floor. 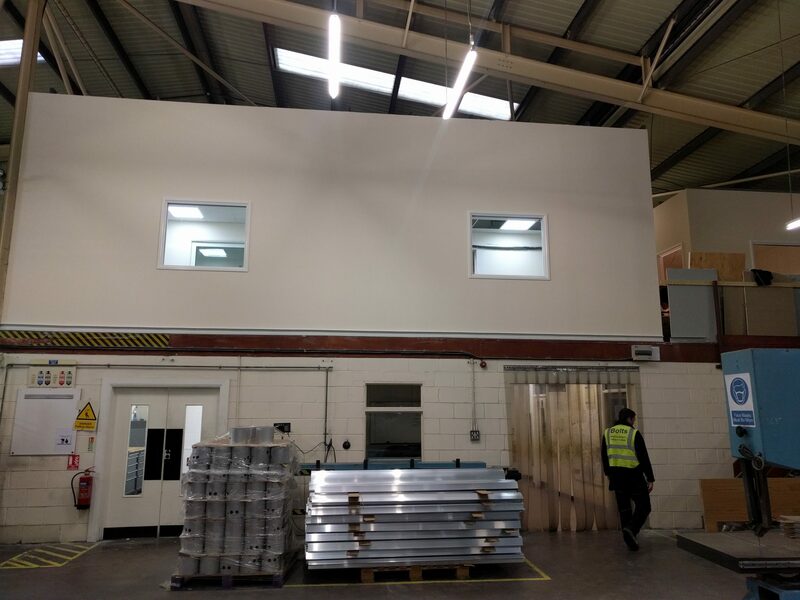 We oversaw the installation of the new mezzanine floor, the fire rating of it, installation of new office partitioning, suspended ceilings, power and data, decorations, floor coverings and joinery work. 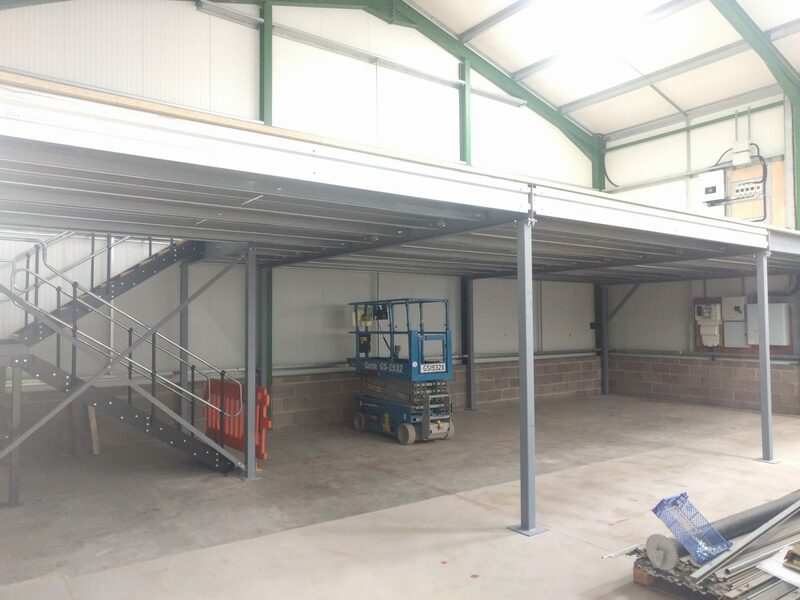 Agricultural company – installation of a new mezzanine floor to create office and laboratory space for a new venture. 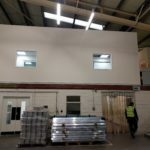 We installed fire rated partitioning and ceilings, decorated, installed floor coverings, plumbing for kitchen and toilets, new kitchen units and worktops were installed alongside joinery works. 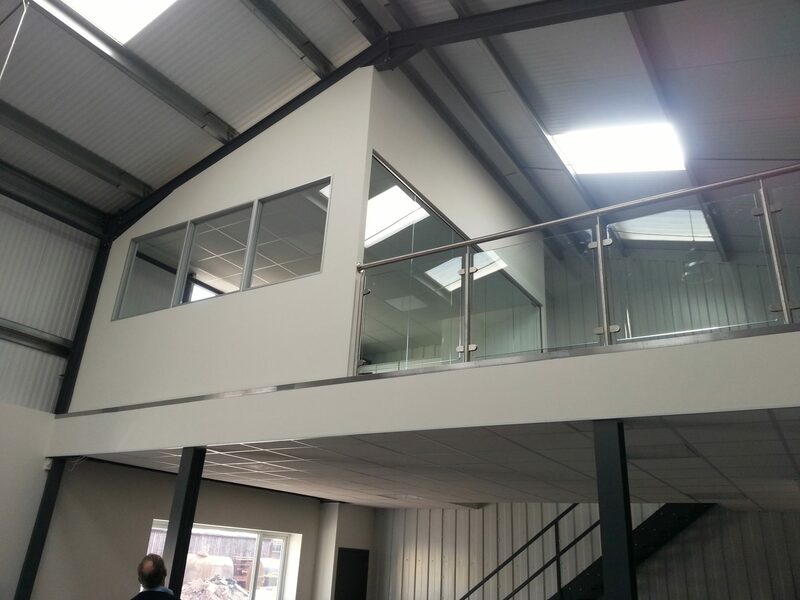 Manufacturing company – this office mezzanine created more office space. 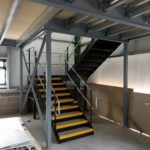 The project involved the installation of the floor, fire rating the underside, then forming new offices on top with acoustic partitions, then a fire rated ceiling and acoustic ceiling, joinery works, decorations, and flooring works. 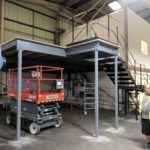 We also carry out fit out works to existing mezzanine floors, we have completed projects for companies where a floor has been installed by a landlord with the customer left with the job of fitting it out to their own requirements. As a rule we primarily work throughout the Herefordshire and Worcestershire areas, covering for example Hereford, Worcester, Ledbury, Ross-on-Wye, Malvern, Monmouth, Leominster, Bromyard, and also into the Gloucester, Gloucestershire, Cheltenham, Evesham, Ludlow and Pershore areas. We do work further afield though, so please do ask us! 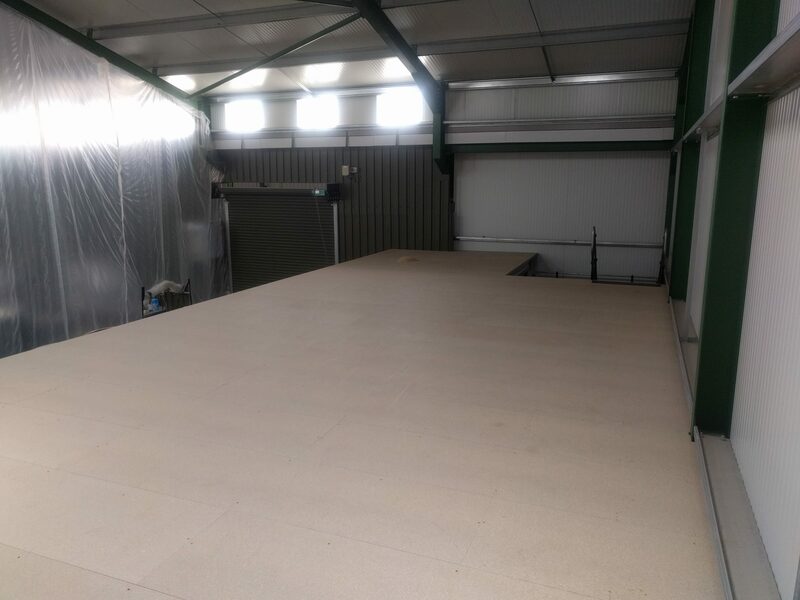 These are something that we are seeing more and more demand for as companies look to make the most of their available floor space. 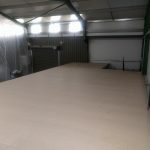 They can be cost-effective use of any available space, and provide more meeting rooms, or storage space, or an additional office – it really does depend on the requirement. If you can help you, or try and offer any advice please do get in touch and we’ll do what we can to help.